Willie Joplin claims to have gotten up in the middle of the night to diagram this shot fearing he might forget it before morning. Set up the shot as diagrammed. 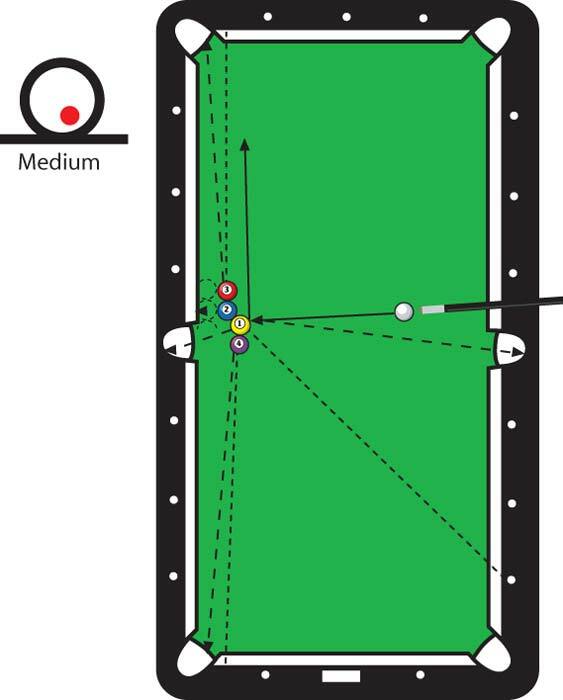 Position the 2 and 3 one balls width off the rail and a half ball down the table from the side pocket. Freeze the 1 against the 2 online with diamond 7. Then freeze the 4 to the one dead to the point indicated on the head rail. Position the cueball between diamond No. 3 and the side pocket. It’s imperative to control “snow” on this shot, so shoot with a crisp draw stroke to stay out of the 3’s path. Aim the 1 half-way between the 2 and 4 balls and the shot is “on”.